. Katana - the Japanese Sword . This is a nice fuchi kashira and menuki a set made in AKA KIN 赤金　( reddish gold, copper mixed with gold ) for a Japanese sword. Fuchi kashira are fittings for the tsuka that help hold the tsuka together. 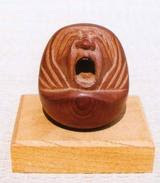 The KASHIRA is deeply incised and decorated in the form of Daruma while the FUCHI is carved with his attributes; his big eyes, his earrings, and the fly whisk, hossu. 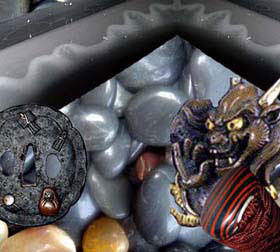 The pair of menuki is made in the shape of Daruma enwrapped in a billowing cloak. The details in very high relief are accented with finely shakudo and gold inlaid in a Yanagawa style. This notable school takes rank with the GOTO, the NARA, and the YOKOYA in the extent of its influence, the numbers of its pupils, and the importance of the branch school founded by them. The founder, YANAGAWA NAOMASA (1692 –1757 ) was a pupil of the early YOKOYA and of the YOSHIOKA, and combined characteristics of both this school. This menuki is signed YANAGAWA. Different families and schools, such as the Goto, Nara, Hamano, Myochin and Yanagawa, evolved and created their own "house styles" which influenced and were influenced by the world/culture around them. 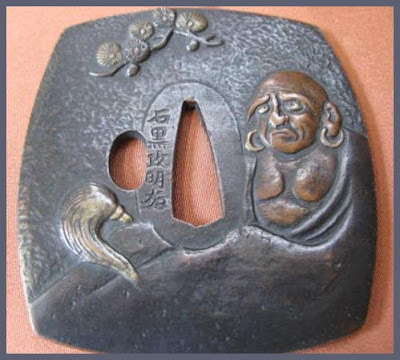 Periodically military requirements made the tsuba return to its more humble beginnings. 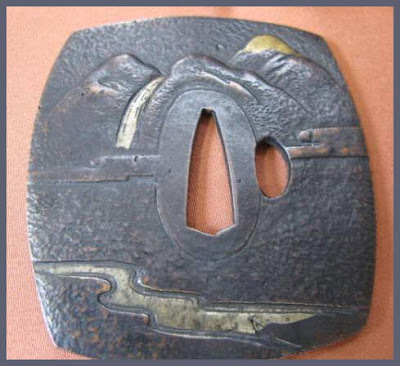 However as artistic skills developed and peace, more or less, arrived, the tsuba became less of an item of defense than a portable work of art to be shown off, given as a gift (let's impress the local boss/emperor/daimyo) and be passed down as a family heirloom. 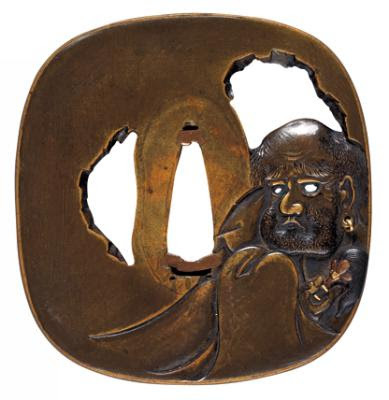 Masterly crafted KINKO TSUBA signed and designed by the artist MASAYUKI. It features the portrayal of the famous ZEN PATRIARCH DARUMA and a HOSSU. This rare piece is of Japanese origin and dates back to the 18th century. MARKS: Artist’s signature “Masayuki” at the Seppa-dai. 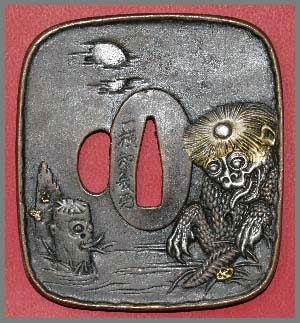 Seal mark underneath the Kozuka Hitsu-ana. MANUFACTURING TECHNIQUE: Forging & chase work. CONDITION: Very good ORIGINAL as found condition with only minor traces of wear and some abrasions. Tiny nicks here and there. NO RESTORATION! Please wait for all pictures to load, as they illustrate the condition very accurately. 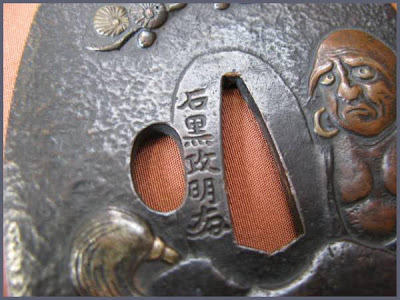 This is an excellent 19th century Kinko sword guard signed and designed by the Japanese Tsuba artist Masayuki. It features a rounded Kaku Gata shape with a Sukidashi Mimi (rim) and boasts an irregular surface. On the front we see the portrayal of the Zen patriarch Daruma executed in high relief. The famous Buddhist monk bears a grimly facial expression and wears a round earring. Underneath the Kozuka Hitsu-ana we find a seal mark also executed in high relief. 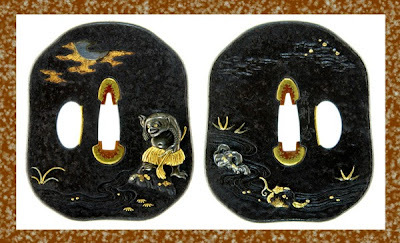 On the verso is the depiction of a Hossu, the traditional attribute of Daruma. The Japanese Hossu has its origins with the fly whisk carried by both Buddhist and Jain monks in India. Its purpose was to gently remove insects without harming them. As a tool of Ahimsa (non-violence), it represents compassionate action. It is also believed that the Hossu removes hindrances. Daruma is the Japanese name given to Bodhidharma, the famous Buddhist monk and the founder of Zen Buddhism. After nine years of continuous meditation, both of his legs had died off. Until today Daruma dolls are popular gifts in Japan, especially when a new business is founded. A Daruma doll is considered a lucky charm promoting prosperity. Because of Daruma’s Indian ancestry his appearance was quite exotic for the Japanese people. Hence he often has been depicted in a slightly caricatured manner. 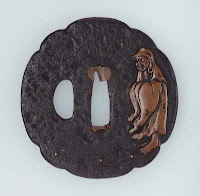 CLICK for more tsuba and menuki photos ! CLICK for more photos to google ! 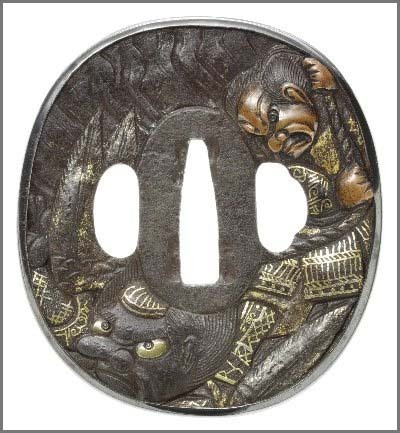 This is probably Yoshitsune Wakamaru Minamoto jumping upside, during sword technics, over crow-tengu Fudo Myoo acessor of Kurama mountain, and waterfall at foot of Kurama temple.
. mokkoo tsuba 木瓜鍔 Mokko sword guard . I have a very similar tosogu. Did you purchase this set from ebay? Attention to detail, design, and decoration are hallmarks of traditional Japanese aesthetics, and these values are shown off splendidly by the decorative elements and accoutrements of the Japanese sword. Furthermore, the sword is believed to be an almost sacred item, capturing the soul and spirit of the samurai warrior -- known as bushido. As a result, it has a deep symbolic content that resonates within Japanese culture. The exhibition "Masterworks of Sword-making: Swords of the Bizen School and Metal Fittings," currently at the Seikado Bunko Art Museum, provides an opportunity to view the oeuvre of Japanese swords and accompanying metal accessories from the Heian to Edo periods (10th to 17th centuries). Each piece in the collection is exquisitely crafted, highlighting the incredible skill and handiwork involved in metalwork and swordmaking. In a tour de force, the exhibition room of the Seikado Museum shimmers from the collective gleam of the 30 blades in the collection. Each is displayed horizontally, and the overall effect is that of a row of majestically seated samurai warriors. In its heyday, the sword was a symbol of honor, loyalty, and social status; surpassing its role as a weapon used in battle, samurai carried the sword wherever they went. Whereas women had ample opportunities to adorn themselves -- with kimono and hairdressing -- the samurai's only outlet for demonstrating stylishness was the various metal fittings that were used to embellish his sword. There are three essential metal accessories for the sword, which are referred to collectively as midokoromono, or the three "distinctive features" of the sword. Although these accessories played a functional role, they were also highly decorative, and gave each sword's hilt and scabbard its decorative flair. The degree of sophistication used in decorating the sword with these items revealed the samurai's aesthetic sensibilities and his social status. On the right you can see the first of these three items, called the kozuka, a pocket knife that is inserted into the scabbard. Also shown is the kogai, a multipurposed instrument that is also inserted into the scabbard. It is used as a hair pick, for combing, grooming and also, surprisingly, ear cleaning. Alongside this you can see a pair of menuki, the most elaborately designed of the metal fittings. They are used to cover the sword pegs that protrude from both sides of the hilt. The sword itself represented the apogee of the sword-master's skill. The finest swords were fired using pure steel, and the forging process aimed to create an item of both beauty and extreme strength. An elaborate process of folding, hammering, and tempering produced a blade with incredible sharpness, as well as what is referred to as the "grain" created when the steel crystallized during the forging. The grain can be seen in the subtle patterning of the blade. The Bizen swords, which are the centerpiece of this exhibition, are so called because they were produced in the Bizen area, which is located in the southeast region of Okayama Prefecture. An abundance of the natural resources used in the swordmaking process are be found there, including iron, water and pine, the latter used as fuel for the forges. Bizen was the largest center of sword production in Japan, and flourished from the Heian Period (794-1185) to the Kamakura Period (1185-1336). One of the prominent features of a sword of the Bizen school is its curvature. Typically, the swords of each Japanese school of sword-making had a unique curvature. Some schools preferred to curve the sword blade near the upper point of the sword, while others curved the sword at the center portion of the blade. The Bizen School swords are all curved near the base, or tang of the sword, the area that is closest to the hilt. These swords would hang from the belts of the warriors. A highlight of the exhibition is a sword created by the famous swordsmith Takatsuna. Because completed swords were considered a work of art, master sword-makers such as Takatsuna signed their names by chiseling them into the tang. This sword was presented by the renowned warlord Oda Nobunaga (1534-1582) to his retainer Takigawa Kazumasa as a reward for his loyal service in battle. The sword ensemble includes a crimson red lacquered wooden scabbard and a hilt covered with black-lacquered stingray fish skin bound in brown leather strapping. 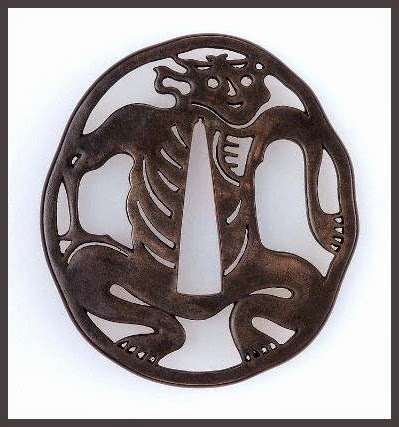 The exhibition includes 48 fine metal accessories, all created by the Goto family of carvers, who served under the shoguns from the Muromachi Period (1335-1568) until the Meiji Restoration of 1868. These accessories, which were highly prized, always included motifs of courageous animals -- lions, tigers and dragons -- as well as scenes from heroic tales. One example at the Seikado was produced by Goto Hojo (1816-56), who was the 16th successor in the Goto line of master carvers. In this set of accessories he has chosen the famous story "Race at the Uji River." The story is about a race between two Genji warriors, Kajiwara Kagesue and Sasaki Takatsuna, to cross Uji River. In the first scene of this story, carved into the grip of the pocket knife, Kajiwara Kagesue is dashing into the river on a black horse, leading his troops into battle. Painstaking detail in this piece reveals the samurai armor in brilliant gold relief, with the billowing waves of the river picked out in silver. In the next scene of the story, portrayed on the kogai, his rival in the race, Sasaki Takatsuna, is shown riding a red horse that is swimming into a river. Sasaki looks fearless as he advances valiantly. In the original story Sasaki has tricked Kajiwara into stopping to check his saddle, thus gaining time and winning the race. 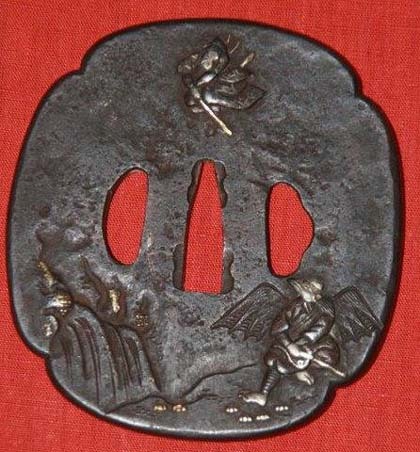 Each of the menuki shows one of the samurai. Stories such as this one set a standard for the sword owner, revealing the true samurai spirit. The tale illustrates the sharp wits that were required in day-to-day interactions, the cleverness of Sasaki's strategy, and the magnificent glory of each of the samurai decked out in full armor. History and literature tell us that the swords created for the samurai were revered and even believed to be imbued with their own soul. A samurai developed a deep bond with his sword, so much so that the sword came to be seen as an inseparable part of himself. With the exception of tea ceremonies, when swords were left on sword racks outside the tea room, a sword never left a samurai's side. It is fitting that the skills of Japan's master swordsmiths and sword-accessory carvers were so highly valued. The exhibition gives us a glimpse of these wonderfully embellished swords and accessories, and the opportunity to imagine for a moment the world of the samurai. The exhibition "Masterworks of Sword-making: Swords of the Bizen School and Metall Fittings" runs until July 25 at the Seikado Bunko Art Museum, 2-23-1, Okamoto, Setagaya-ku, Tokyo.